Hello!! We are into the fun part of our home renovation where the design decisions are coming to life! It is so exciting to stop by the house these days and check in on the progress. Catch up here! Today, I wanted to share the design plans for our upstairs hall bath and the progress!! Hint: Tile is in!!! First things first, a reminder on where this bathroom started...the home's original ONLY bathroom. It was retro at best. Looking back now, I can't believe we weren't planning on updating this bathroom from the start. I almost forgot what this bathroom looked like and can't believe how obviously the dip in the floor is looking at the photos. Spoiler alert: That dip in the floor turned out to be a rotted sub-floor, which meant...BATHROOM UPDATE!! So we demoed and shifted the floorplan a bit. We wanted to go from a pedestal sink to a built in vanity to get more storage in this room, which also meant we needed to move the toilet. This is a really bad photo of our old closet, but you get the point. It's to the right of the shower and we knocked out the shelves to move the toilet into a private area here. The shower is really the only thing that will stay in the same place, but get a much needed update. And now to the design plans!!! This bathroom will be a shared bath between two rooms upstairs. For us that will likely mean guests for the time being but down the road for a future home owner it could mean kids. It was so important to me to find the right balance of style and functionality. And of course, price! Price and tile can be one of the hardest things when renovating, so I wanted to share the pricing we found for the tile in this bathroom. For the walls, I went with a pretty standard subway tile. It was around $2 / sq ft, which was an upgrade from the .19 cent subway tile from Floor & Decor. I picked it because the white undertones looked best with our tub finish and floor tile. It's super subtle but I went with the tile on the right. It felt more pure white than the other. This is the $2 next to the like $10 one from another tile store. The $2 was WAY better. Ignore our gross tub!! We will refinishing it. As a guest bath for now, I wanted to pick a more sophisticated floor tile but in a material that will be super durable down the road. There are some many lovely porcelains now-a-days that look just like marble (not to mention they are a fraction of the cost). 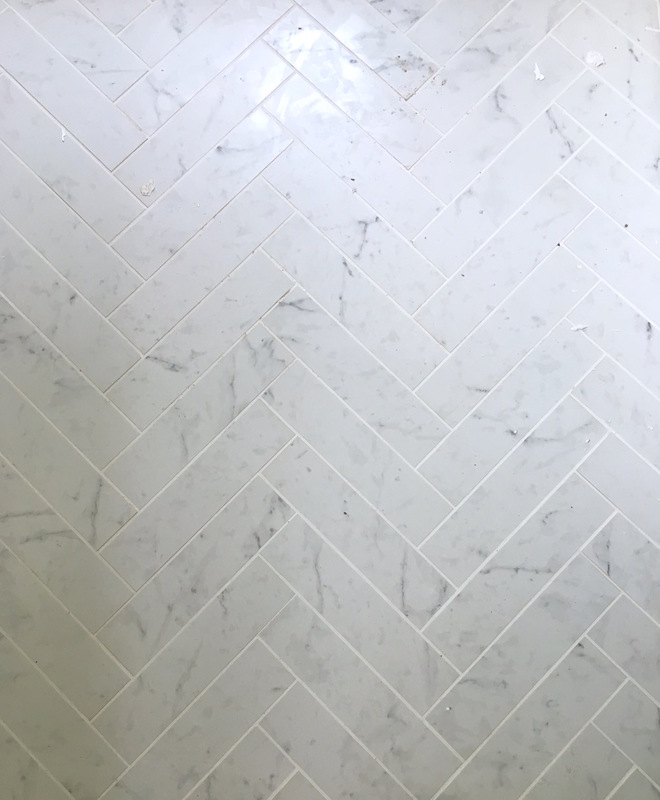 I picked this lovely carrara look-a-like porcelain in herringbone! Price here was a bit more expensive than if it wasn't herringbone at just under $10 / sq ft.
For the vanity, I absolutely love this design scheme by Studio McGee. All of my color choices are pretty much in line with this inspiration with Coventry Gray for our built-in cabinets and Sea Salt walls. It looks super green in our test swatch photo but I am excited to see how it'll turn out. Here's a really rough look at how the layout will look with the new vanity. We went with one sink to the left of the space so we could have more counterspace. For the design, I wanted to mix metals and bring on some mid-century glam to juxtapose the other more traditional design choices. I can't wait to see how it all comes otgether!! This week, we'll be choosing our floor stains so check out Instagram to follow along!